Kenneth Anger to unveil Unseen Cameron, Crowley & Norton Art – Zero Equals Two! The Lucifer Brothers pop-up art gallery and store is the culmination of Kenneth Anger’s lifelong obsession with the occult. In 1955 Anger was the first to revisit Aleister Crowley’s former temple in Cefalù, Sicily. 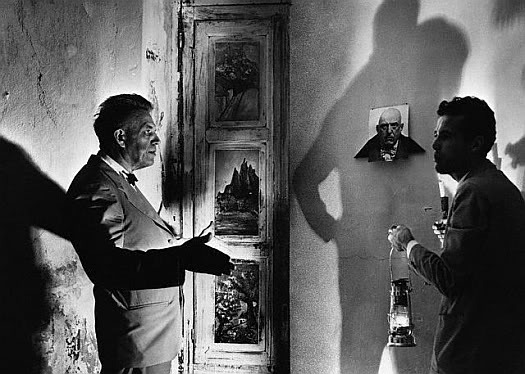 With the help of Alfred C. Kinsey, Anger painstakingly restored Crowley’s otherworldly murals which spilled across the inside walls of the villa, removing layers of whitewash to reveal the nightmares underneath. Prior to this Anger connected with Marjorie Cameron, the widow of famed JPL rocket scientist and occultist Jack Parsons, casting her in his classic film Inauguration of the Pleasure Dome in 1956. Recently the art world has taken great interest of Cameron’s body of work, with her esoteric art—or what remains of it—included in the popular museum exhibit “Semina Culture: Wallace Berman & His Circle” and in recent solo career retrospectives of her work in Los Angeles and Manhattan. After attending the Cameron exhibit at MOCA and a follow up showing at Jeffrey Deitch’s gallery in New York, Anger lamented that Cameron’s most powerful occult works remained unseen. Through his web of arcane connection’s Anger now unveils Cameron’s monumental life-sized portrait of a demon entitled “Blue Prophet” which was inspired by visions Cameron experienced during her marriage to Jack Parsons and her part in the infamous Babalon Working ritual that included Scientology founger L. Ron Hubbard. Other works by Australian artist Rosaleen Norton (aka “The Witch of Kings Cross) whose powerful paintings are seldom encountered in the US, British occultist Aleister Crowley and Anger himself will be made available to the public for the first time. Kenneth Anger is lauded as an influential experimental filmmaker, actor, and author of the infamous Hollywood Babylon gossip books. His films, which include Inauguration of the Pleasure Dome (1954), Scorpio Rising (1964) and Lucifer Rising (1980) have inspired filmmakers as disparate as Martin Scorsese, David Lynch and John Waters.